President Trump has often called his tax plan a "tax cut," and an early analysis suggests it will be a modest one for most Americans. But it's increasingly clear that it will probably be a tax hike for a sizable portion of the middle class, a perception that Republican leaders have spent this week fighting. An analysis by the nonpartisan Urban-Brookings Tax Policy Center last week found that more than 30 percent of households with income between $150,000 and $300,000 would see a tax increase if the plan were put in place next year, stirring criticism and concern. Who are those people? Because of all the moving parts of the tax plan — including a number of important details that have yet to be filled in — predicting the circumstances of any specific household will depend on a range of details from family size to the number of deductions they take. This week, President Trump's economic adviser, Kevin Hassett, criticized the Tax Policy Center analysis as "fiction," arguing that the analysis -- which extrapolated key details based on past plans -- was inaccurate. But there are definitely groups of people who are more likely to face a tax increase than others under the current GOP framework. One of those at risk is Joel Peters-Fransen, a 32-year-old tax lawyer from Plymouth, Minn., who has been closely tracking the emerging details of the plan. His family of six falls within the top 20th percentile of income, more than $150,000 a year. Making some assumptions about the effect of the child tax credit and where the income brackets will fall under the new plan, he expects his family could experience up to a $6,600 increase in taxes. "The vast majority of my higher taxes will go to give benefits to people with higher income and wealth than me. I would be more OK if tax reform actually were used to make the system fairer or build roads or schools etc., but this is naked upward redistribution and leaves a very bad taste," Peters-Fransen said in an email. Today, only 30 percent of taxpayers itemize their deductions — and far fewer will itemize under the GOP tax plan, because it will double the standard deduction. While a bigger standard deduction will benefit many people by simplifying their taxes and increasing their standard deduction, there are a segment of people who will lose deductions, such as the ability to deduct state and local property taxes or medical expenses, that have lowered their taxable income to date. People in the upper middle class are far more likely to itemize. Less than half of households with an adjusted gross income between $50,000 and $100,000 itemized, while more than three-quarters of those making between $100,000 and $500,000 did, according to a Tax Policy Center analysis. At the very upper end of the income spectrum, other changes in the plan — such as lowering the top tax rate and creating a lower rate for pass-through filers — are likely to provider tax relief, and deductions are already limited at the top. "You're talking about people whose itemized deductions are worth a lot. They have to be in a higher tax bracket, have high amounts of itemized deductions," said Benjamin Harris, a visiting professor at Northwestern University's Kellogg School of Management and former Obama administration economic adviser. "But this isn’t just people in California and New York; it's upper-middle-income people in the middle part of the country." 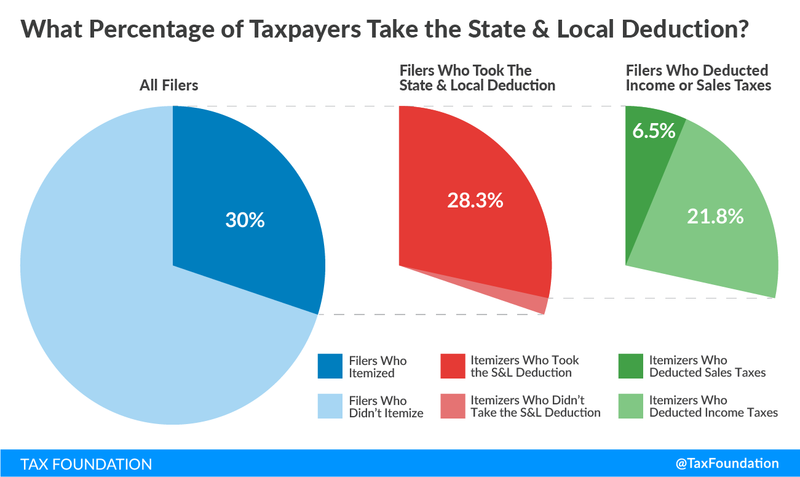 Of the three major deductions people take, one of the most well-used ones has been targeted for elimination: the ability to deduct state and local taxes. This was proposed during tax reform in the Reagan years and also under President George W. Bush. Republicans may think it has a shot this time around, because it can be portrayed as a tax break flowing mainly to blue states. States such as New Jersey, New York, Maryland and California all have large proportions of people taking the deduction because taxes are high, but it is utilized by Republicans and Democrats alike in such states — and people in red states use it, too. In places such as Ohio's 12th Congressional District, held by a Republican, a third of taxpayers use the state and local tax deduction, claiming a value of $11,572 on average, according to an analysis by the Government Finance Officers Association. "It's safer for Republicans to pursue this now, because red states don't, on average, levy taxes as high as many blue states. I am personally a little dubious about that," said Joseph Thorndike, a historian at Tax Analysts, a nonprofit publisher that specializes in tax issues. "Rich taxpayers in every state are going to be interested in this, because they’re itemizing anyway. If you own a big house, you itemize. There are plenty of itemizers in each of those states." Although the impact would tend to be biggest in coastal blue states, more than a fifth of tax returns in solidly red states such as Kansas and Nebraska would increase by more than $1,800 on average, according to a Tax Policy Center analysis of repealing the deduction alone. That analysis does not take into account the important fact that many people who take the deduction today will not take it at all under the plan, but it does give a sense of how widely used the deduction is. The plan repeals the personal exemption, which shields $4,050 of income from taxes per family member. It's easy to see that some larger families could potentially be worse off. Under the old rules, a couple with four children — such as the Peters-Fransen family — would get $24,300 just from personal exemptions. Then they could add deductions onto that baseline. If they didn't itemize, they'd also get a standard deduction worth $12,700 — shielding far more of their income from taxes than the doubled standard deduction. For larger families who itemize their deductions, the Republican proposals also looks like an increase in taxes. That could change depending on expansion of the child tax credit — which could offset some of that increase. But increasing the child tax credit significantly could add to the cost of tax reform. It could also depend on where the tax brackets are set — another question Republicans need to decide. In the end, the winners and losers of the tax plan will be determined by negotiations that are underway already and hinge on the scale of harm they might bring to competing constituencies. Aparna Mathur, a resident scholar at the American Enterprise Institute, said that a reasonable way to attempt tax reform is to make sure the bottom 80 percent are helped or at least not hurt by the plan, while the top 20 percent pay a little bit more. That, she said, appears to be the general contour of the plan — although the big challenge is that people who are affluent but not in the 1 percent see people above them getting a much bigger benefit. "Yes, there must be some people who have very big families, who live in expensive states, who are going to get hurt," Mathur said. "It's not the struggling, low-income people. ... If we talk about tax reform, and we talk about having to raise revenue, it's not all going to come from the top 1 percent."